Vote: Should Obama cancel his Asia trip due to the shutdown? It's day three of the government shutdown and two members of Congress, Rep. Sheila Jackson Lee and Rep. Mike Kelly join hosts Stephanie Cutter and Newt Gingrich in the Crossfire. 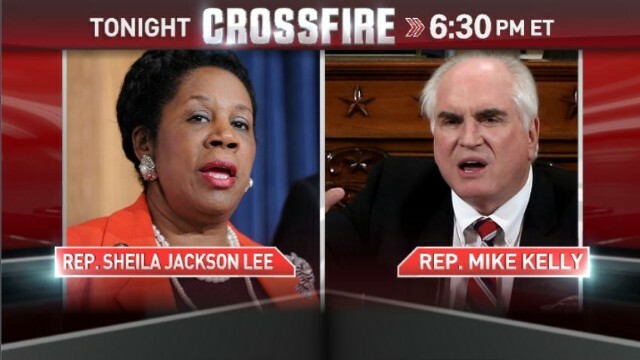 Jackson Lee, a Democrat, wants the government reopened with no strings attached, while Republican Mike Kelly wants the president to negotiate. Join the debate by voting on today's question: Should President Obama cancel his entire Asia trip due to the government shutdown? You can also tweet your response using #Crossfire. Gee guys - It's about the budget not Obamacare/ACA - Normal people need to be able to pay their bills . They can't rely ion a bailouts like their creditors. Pass a budget and quibble about your fascist ideology later. Obamacare/ADA is a done deal. Get over it! Try helping for a change ! And never post to CNN when you 're drunk. Of course! The rest of Americans have to change their lifestyles when the shutdown occurs and do without...so should those who should provide a solution. I think they should do without pay (like many of us), go on the healthcare they claim is so great, and not get any sleep like the rest of us until this is over. If the pressure where on them they would be quick to find a solution! Good golf in Singapore. Fly coach this time and conserve the $hundred million to pay capital police. President Obama should take few days off to go fishing. He's been fishing for a way to move forward for a long time. It's time to re-look and re-define the "founding fathers" ideal of democracy. There's obvious party lines as to how this should go. Shutting down the government intentionally was never part of that vision. The moronic moves by the GOP controlled House is twisting the ideals of founders and the current reality of voting citizens beyond belief. It's time to man or woman-up to what has already been committed and serve the people that you were elected to serv. If it is for the countries business then take the trip but no vacation stops. It really doesn't matter if He is here, the president is not going to provide any leadership or negotiate. I'm 24 years old, I have my own freight brokerage business and I work for cell phone company an I'm putting as much money away to fund my degree in law and political science so I can become a proud congressman that stands for "we the people". I thank every last congressman and congresswoman for showing me what not do and what not to be when I serve on our fine capital hill. In my eyes we are saving money and making it less complex on my generation by keeping a bunch of high school drama kings and queens away from passing laws that I am govern by day in an day out. It's cool for every American to have a gun and possibly take another life but it's wrong for every American to have health insurance to save his or her life.really congress? I tell you in 2023 when I ask my fellow man to vote for me and place there trust in me to make to right call for the long haul of OUR NATION to know I'm there to do just that. I'm not here for some hide in the shadows pulling the strings big business monster, I'm here for that teacher, cop, solider, doctor, factory worker, trucker and even that homeless man that has no place live but is glad to be a American. Congress thanks for turning your back to the same people that put you where you are. I love you "we the people" and one day youll see my love for our country. Until than pray that congress understands that it takes unity to be united. Obama needs to cease all his spending and realize when an entity is in debt, that spending should be cut in any manner possible. Normal people have to stop spending when they don't have money. This current administration wants to keep spending and raise the debt limit so they can spend more. Let's say, for the sake of argument, that "Obamacare" is as bad as the Republicans say it is. Why not let it fail? All the Republicans would have to do is stand aside and let it implode. They would gain immeasurable political capitol if that were to happen. Nothing's better than being able to say "I told you so" in politics. Republicans would be able to ride that tide into control of both houses of congress and the White House. Plus, as an extra added benefit, they would not be enduring the negative opinions now associated with the shutdown. But, that's only if "Obamacare" is the monster they claim it to be. Food for thought. Do to his stubborn leadership in America, I say we won't miss him anyway to if he is out of the country, so much the better. There are a lot of conferences out there, that have begun to be cancelled. Example the US Patent conference organized by the US Patent agency. I think it is wise if the President cancels his trip. Let him take the trip, he has said no negation and that is final. So we won't miss his lack of leadership here. Yes, President Obama should stick to his schedule and I hope he can even get in a round of golf. I am wondering how we can ever have any respect for our governing body again. If Cruz or the likes of him is voted in again I throw my hands up. Boehner and many other Republicans promise not to allow any progress to be made as long as Obama was in the White House and they are doing all they can to keep their word but have they considered the harm they may be doing to their career or maybe they feel it is worth it. What a sorry state of affaires. Are you the Barbara I once knew ? If yes, greetings from an old (!!) pal. If people would quit voting for anyone with a D or and R next to their name we could change things. QUIT getting sidetracked by their drama! QUIT VOTING FOR THEM! Yes, This president can walk and chew gum at the same time, unlike the last guy. If congress gets their act together he can sign the bill electronically as he already has before. He has told the republicans he is not going to negotiate on this, or raising the debt, and he won't. so what else is there for him to do, he had the meeting they were requesting with him, that did exactly what he thought it would, nothing but a chance for them to say he won't negotiate with us, but he will with Russia and Iran, Yeah, that stale talking point, so the ball is in their court, when the stock market keeps sliding and investors freak, the money men will have the talk with the Weeper of the House and this will be over. The only reason this is still going on is the weeper don't want to give up his job, but I think he's out soon anyway. He has to be the worst one ever. Why cancel his trip? He isn't going to accomplish anything here. Maybe he can stay an extra day or two and get in a round of golf. I have tried several times to vote NO that the Pres. should NOT change or cancel his trp to Asia. The solution is to vote on the Senate's clean Cr Bill which and already passed the Senate and passing this bill could be sent limmediately to the Preident for signature. That would open the US Govt today! The Tea Cuppers and Republicans will NOT allow a vote in the House on this bill. THEY revuse to negotiate and refuse to be reasnonable. Not enough Americans have been HURT yet! They want to count the boidies and tehn blame their deaths on the Democrats and the President. President Obama does not need to stay home for this ridculous and insane activity God Bless America!! Get this disgusting show off the air. All it does is polarize and get people even more angry at each other. CNN, try putting some actual news on the air once in a while. Conservative intransigence in incurable. Conservatives terrorism isn't going to stop. These ill mannered uncultured conservatives aren't going to learn manners of decorum. Because conservative dysfunctionality have inflected Congress does not mean the White House should stop functioning also. This is the Information Age. Obama has the technology to work anywhere on earth. I'm with the president, more or less, on the shutdown, but he should not leave town while this is going on. Government shut down means just that. Nobody should be leaving DC until this is fixed. How about we save the money from an international boondoggle by the president and he stay home and help negotiate a true budget for the country. Both parties are to blame for this situation, but the lack of leadership by the POTUS, Senate and House is deplorable. Obamacare is purely the straw that broke the camels back. The plot to undermind Obamacare is coming from representatives and senators who are actually listening to their constituents for once and doing what's in the best interest of their constituents and not the political games of washington. It's time for both parties to realize there is a middle ground when it comes to sequestration, entitlement reform, defense spending, obama care, etc...pass a budget instead of 5 years of continuing resolutions....and how about they read a bill and understand it's implications before passing it! If Congress gives up their paychecks....yes, otherwise no he should go. This impasse is about a civil war in the GOP. It should not interfere with the other duties of the President. 1) Being American is an embarrassment nowadays as people abroad are all laughing at us. 2) Government shutdown means government shutdown, i.e no money for Pilots or fuel for Air Force 1. Nobody gets to pick what can be funded. why isn't there a blurb on why he's going to asia? I doubt its vacation, he prefers Hawaii.... so the question is, should he not participate in talks with other countries because capitol hill is busy squabbling? Cancel his trip and miss his tee time? Perish the thought. We all know that we are in over our heads due to the spend it now and worry later. If we had no federal goverment getting paid we would climb out of this problem . NO work NO pay ! If Obamacare is truly for everyone then everyone is to puirchase and play the game no matter whom it is or how much they make PERIOD! Stop the games,Stop the BULL in the Goverment we ALL must pay PERIOD!!! Yes, he can go play with his friends, but make sure he comes home before dark. And don't forget to hold his hand when he crosses the street. Yes, I think he should cancel trip. Why not just use a video conference call. Think of how much money would be saved. If it was used more. As long as he uses his personal funds and fly's commercial without taxpayer funded protection he's welcome to go. But the government is not currently funded and he is non-essential. Didn't CNN ax this show? Only cancel his return trip home! This Government Shutdown is going to be remembered for years to come. The Republican and Democratic Parties are embarrassing them selves. There plot to undermind Obamacare is uncalled for. The people of this great Country are not going to sit by and watch those Politicians up on the Hill discard President Obama's Obamacare. We have the Right to Vote andThe Right to Vote you Out. Get with it Guys. O bummer care is a train wreck waiting to happen and those people who want to keep it are a cancer on our constitution. Those who support O bummer care listen to all the lies and believe they are the truth. Funny how you say the people of our great country won't sit by and watch those politicians decard O bummer care. Well the majority think there needs to be changes made, at the least before it is implemented. So sit back and learn some things before you start spouting how something is wonderful. Don't take the lies and try to make them truths. Our problems with out medical system could be fixed without this monstosity of O bummer care ready to take away our Liberties. That's funny. 90% of the same people will be re-elected. Everyone thinks that every representative other than the one they elected is worthless while theirs is great. Its not like this is the first government shutdown we have survived. It's the 18th time since 1976. The last one was in 1996 lasting for 3 weeks. I doubt this shutdown will loom on too many minds for too long after it opens back up. The actions of all the politicians is embarassing. However, if they (and you) don't believe that ObamaCare is forcing people from full-time work hours to part time work hours (which means they will have LESS money to pay the tax/penalty for not having health care) then you are an idiot (or tenured professor). Undermine Obama? Obama should stop undermining the Constitution! There are other places to cut the budget. John Boehner’s favorite lobbyist Lockheed Martin receives billions of American tax dollars every year through foreign aid packages that mandate purchase of arms from USA manufacturers. The world really doesn’t need more weapons in the hands of Mid-East countries. Lockheed could as well use the subsidy to develop space travel technology. Mixed up priorities because lobbyist run the show. When did they come up with cutting the budget? To sign the CR. The President and Dems are already using the figures below the Ryan Budget range, not what the President wanted and they won't sign and It's their numbers. All I have heard is the reason they won't sign the CR is they want to defund Obamacare or delay it for a year, or take out the medical device tax, I have heard nothing on the budget. Basically they are trying to blackmail the President or American People, over a law that was passed and declared constitutional by the supreme court, that if they don't get it their way they are going to shutdown the government and or not increase the debt limit. My question is why do the Republicans not want the American People to have health insurance?